Like many things in life, there's an easy way to do something and a hard way. For instance, Mozilla has a very complicated tutorial on creating your own Firefox search plugin, which I muddled through to create a plugin for Digital Alchemy. You can download the XML file here, and place it in the searchplugins folder inside your Mozilla Firefox directory. Then restart Firefox. Alas, a simpler way was made available a few days later. 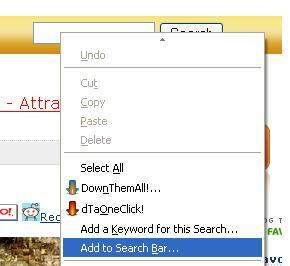 With the Add to Search Bar extension, all you have to do is right-click in any search box and select Add to Search Bar. Give your search engine a name and icon, and presto! A new search engine is added to the search bar. The pictures above are actually kind of a lie since this extension doesn't actually create a working search plugin for Digital Alchemy (get the working one here). Although it doesn't work on all sites, this extension is very, very helpful when it does work, and should be seriously considered for inclusion in the next release of Firefox. What Happens after You're Tossed out an Airlock?